This video discussed the evaluation and management options for a large pedunculated duodenal polyp. It demonstrates, in a stepwise fashion, the process we utilized to perform the polypectomy. Polypectomy in the duodenum is more technically challenging than polypectomy in the colon. It is associated with a higher rate of adverse events, and the consequences of such events are potentially greater. Due to the lower prevalence of duodenal polyps, the skill set to safely and confidently manage these lesions is more difficult to acquire. Furthermore, some gastroenterologists may never have been exposed to the management of these lesions during their training. For the aforementioned reasons, performing therapeutic endoscopy in the duodenum can be intimidating. However, the general principals of endoscopic polypectomy are the same in the duodenum as they are in the colon. Similarly to the colon, a polyp in the duodenum incompletely excised during the first attempt is more difficult to completely excise at a later date. However, in selected cases, any endoscopist can undertake management of these lesions in a safe and efficient manner, even with unusual equipment. Under the appropriate circumstances, with the right polyp, it can be safe for any endoscopist to successfully manage a duodenal polyp. However, there is a substantial adverse event risk and endoscopists should have the skill set to manage these should they occur. Stop, think, evaluate and proceed only if safe to do so. If you aren’t sure of a complete excision, ask for help from a more experienced colleague. Figure 1. Stepwise management of a pedunculated duodenal polyp using a needle knife. 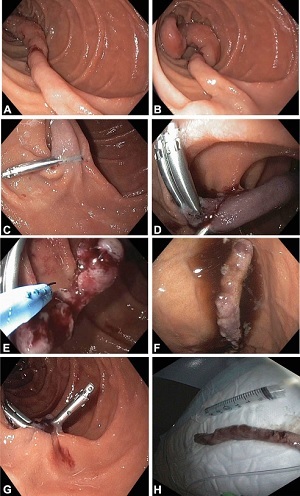 The pedunculated duodenal polyp was not amenable to endoscopic snaring (A, B). Hemostasis clips were prophylactically applied (C, D) and the stalk was transected using a needle knife (E). To prevent specimen loss, the polyp was withdrawn into the stomach (F). Inspection of the polypectomy site revealed no hemorrhage or iatrogenic injury (G). The retrieved specimen measured over 8 cm in maximum diameter (H). Thank you for your interest. The malignant potential of Brunner’s Gland Hyperplasia appears to be low. Culver and McIntyre in Endoscopy 2011; 43: 144 – 155 present a comprehensive review of duodenal polyps which describes these lesions in detail. In the case presented in the video, the symptomatic nature of the polyp necessitated its removal. The nature of the lesion was only revealed afterwards.